I’m hijacking the Backstage Baker to blog a recipe I have been meaning to blog for years. 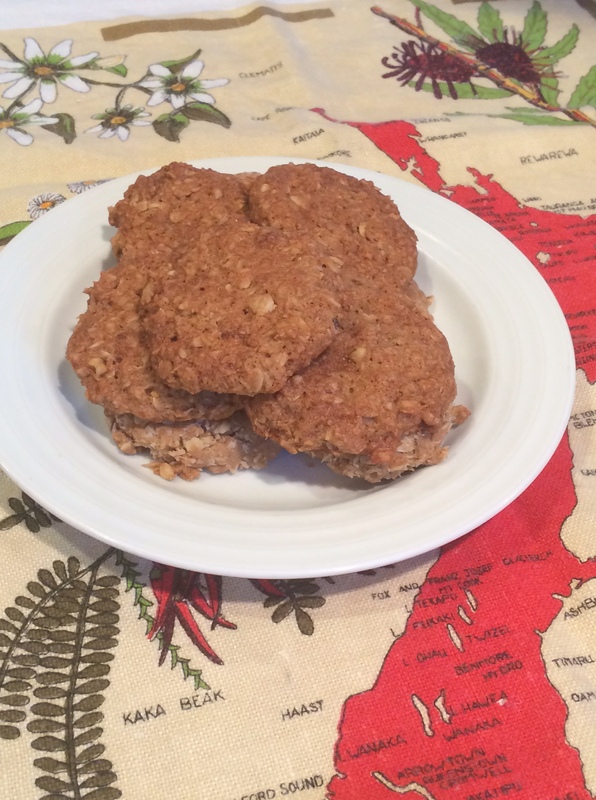 ANZAC biscuits are the traditional cookies baked to celebrate ANZAC day, April 25. My excuse is that it’s a holiday we don’t celebrate here in the US, so I never have fair warning. Luckily, one of my Antipodean cousins reminded me in time to get it together this year. 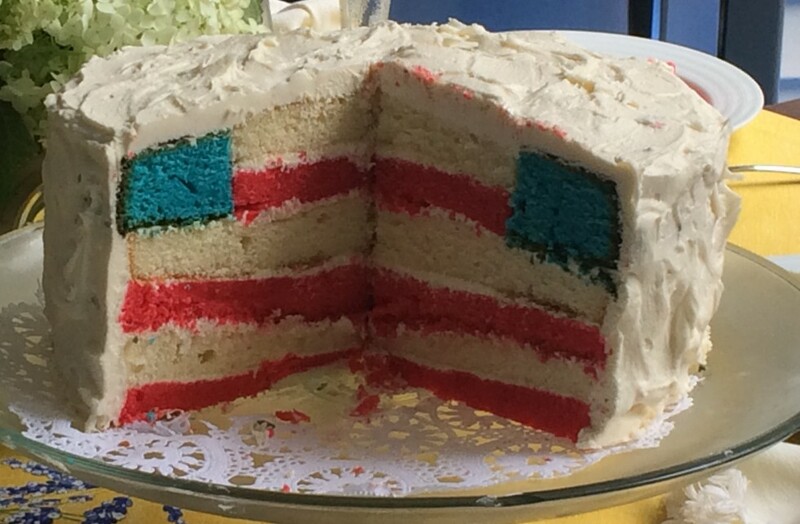 And perhaps it’s appropriate that I’ve waited until the 100th anniversary of the battle it commemorates to share this recipe. Gallipoli is also a battle in which my great-Uncles Frank and Maurice Loftus fought, so this holiday is about a little more than cookies for me. Great Uncle Frank corresponded regularly with his mother, and sent these letters home. His Kiwi understatement combined with his sharp observations of battle are incomparable, and we’re so lucky these letters were preserved. So read them. If you want. My mother once told me a story about visiting a New Zealand veterans’ home with her Catholic School choir. There was one man there, she said, who had been dreadfully wounded at Gallipoli and lost his arms and legs. He was carried into the room in a small basket, and had the most beatific smile on his face as the girls sang. My mother always felt guilty that she broke down in tears when she saw him and was unable to sing. Anyway, the story behind these biscuits is that they were baked and sent by the wives of the ANZACs to the soldiers because they travel well and don’t spoil easily. I think this explains why they have never been a particular favorite of mine, but if you ever need to send biscuits to soldiers overseas, these are the ones to make. Below is my mother’s recipe for ANZAC Biscuits. 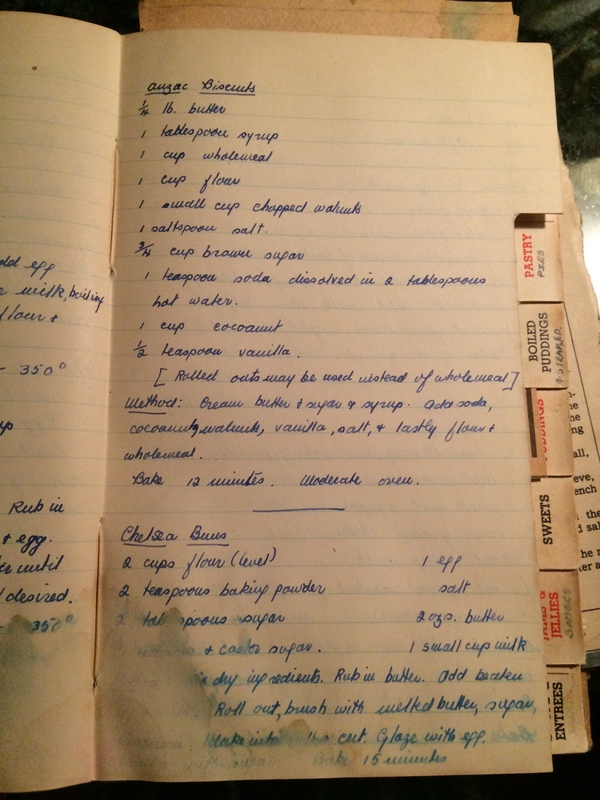 I’ve adapted it below for American ingredients, but don’t you just love the neat handwriting my mother had!! In a stand mixer, cream butter, sugar, vanilla and Golden Syrup. in a separate bowl, whisk oatmeal, flour, and salt. Add dry ingredients and baking soda solution to creamed mixture and mix until just combined. Stir in walnuts and coconut by hand. Bake for approximately 10 minutes. Remove from cookie sheets and let cool.